Rugged construction meets modern styling in the new Casio G-SHOCK and Burton Snowboards collaboration. 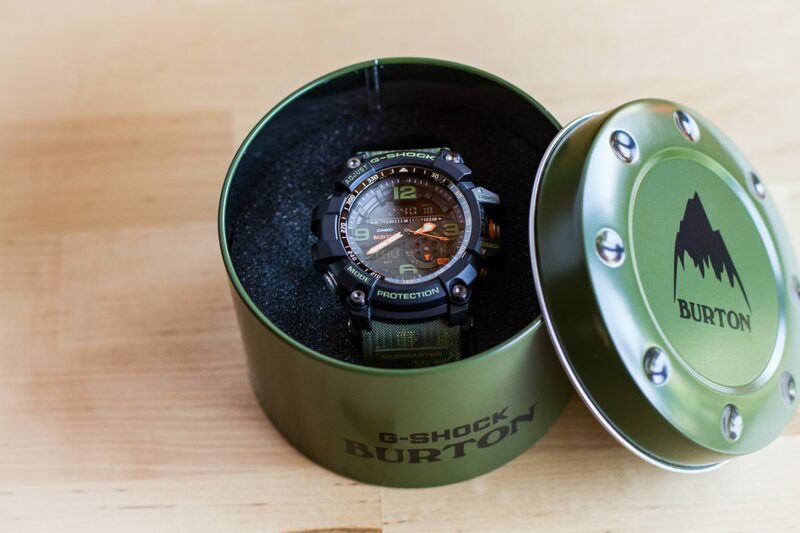 Part of the G-SHOCK brand’s 35th anniversary celebration, the new collab with Burton tricks out a MUDMASTER model from the “Master of G” outdoor line with a unique duck camouflage pattern on the sturdy mud-resistant strap and safety-orange highlights on the analog display. Complete with the Burton motto of “No Bad Trips” engraved on the case back, this collab is a mountain-oriented take on one of G-SHOCK’s popular outdoor models. 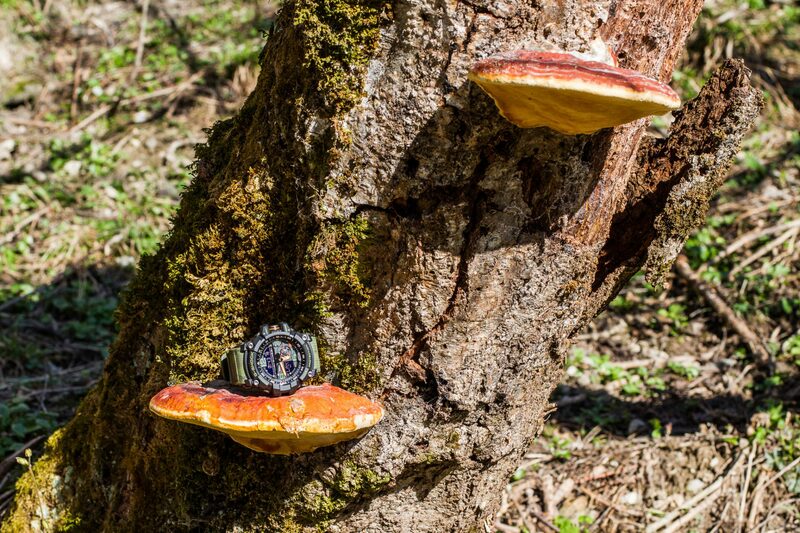 Right out of the box, the G-SHOCK Limited Mudmaster (GG-1000BTN-1AER) impresses with its sheer size. With a bulky housing diameter of 55mm, height of 17mm and weighing in at 100 grams, this is a beast of a watch that speaks its ability to withstand the elements in its exterior design. Within that fortified housing are all the various bells and whistles that have made G-SHOCK one of the leading names in ruggedness. Water resistance, electric shock resistance, vibration resistance, low-temp resistance, and so on—long story short, few things short of a nuclear blast will stop this thing from ticking. And if for any reason you or anyone around you didn’t get the memo, the bold “G-SHOCK PROTECTION” emblazoned on the face hammers the point home. A quick rundown of the standard features: you’ve got your analog and digital time and date display; a world clock function that lets you quickly change time zones, including a convenient preset if you often change between two different time zones; a stopwatch, four daily alarms, countdown timer and auto LED light. Where the Mudmaster begins to diverge from the pack is in its “Twin Sensor” technology, an integrated thermometer and digital compass. The thermometer is certainly a useful tool for your outdoor adventures—though keep in mind that to get an accurate reading, you have to take it off your wrist and let it adjust to the surroundings. The highlight feature, though, is the digital compass. At the push of a button, the second hand of the analog display converts itself into a compass needle and goes spinning away until it points north (adjustments for magnetic declination correction are included), while the digital display indicates the bearing angle with wich the watch is currently aligned. You have to hold the watch horizontally during compass operation, of course, and the margin of error on the bearing angles is ±15 degrees; but combined with the bearing memory function, the compass becomes a powerful navigation tool. With the bearing memory function you can save a particular bearing—say you want to be traveling south-southwest at a bearing of 200º—to memory. The digital display then provides indicators to keep you on that bearing: a little to the left, a little to the right, and solid black bars for full speed ahead. For cross-country travel when you lose sight of visual markers en route to an objective, this is an effective method of making sure you’re still pointed in the right direction. In fact, with a list of reference points and accompanying bearing angles, you could theoretically use the Mudmaster to orienteer yourself point-to-point through your outdoor adventures. All that said, the digital compass is certainly a powerful tool, and a fun thing to play around with. How many of us will actually put it to good use as a navigation tool is another question. Unless you’re a wilderness professional, guide or avid backcountry adventurer making frequent use of a compass in your exploits, the Mudmaster’s signature feature may go underutilized in your daily life. And particularly given this narrow focus of utility, it’s a bit odd that the G-Shock Burton collab doesn’t include an altimeter—seemingly a no-brainer for a partnership with a mountain-oriented brand. If you’re one of the above-mentioned compass-wielding badasses, the G-Shock x Burton Mudmaster can certainly be a clutch addition to your kit. Though the pros will continue to rely on GPS and field compasses for principal navigation, a wrist-based quick reference tool and backup is a handy convenience. For the rest of us, the G-Shock x Burton collab is a rugged piece of wrist candy that can always tell you where north is—a fun party trick at the least, and a highly practical tool that could save your life at best.